In previous article, we wrote “How to Send and Receive Money via Paypal” and now if you already have money in your Paypal A/C and then want to withdraw it to your bank, then follows these steps. In fact, you should firstly visit Paypal website help center to see: “Withdraw funds“. 1) You firstly need to add Bank Account. Click “My Account” – “Profile”, for “add or Edit Bank Account”. Here in China, we can add US, China and HongKong Bank. Please note the bank name should be the same with what you register in Paypal. 2) After bank account added, then you can click “Withdraw”. I have already added a China and HK bank, so you will see two options. If to China, the currency will remain the same (if you withdraw USD, then you will get USD); but it’ll charge USD 35.00. 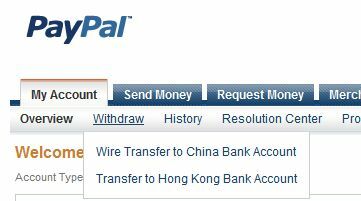 Sometimes Paypal will has promotion and will be cheap to China. If to HK bank, then it’ll transfer into HKD firstly and then you can only get HKD. But it’ll be free if the amount big than HKD 1,000. (or 5,000, not quite sure). Choose the amount and the bank, click “continue”. 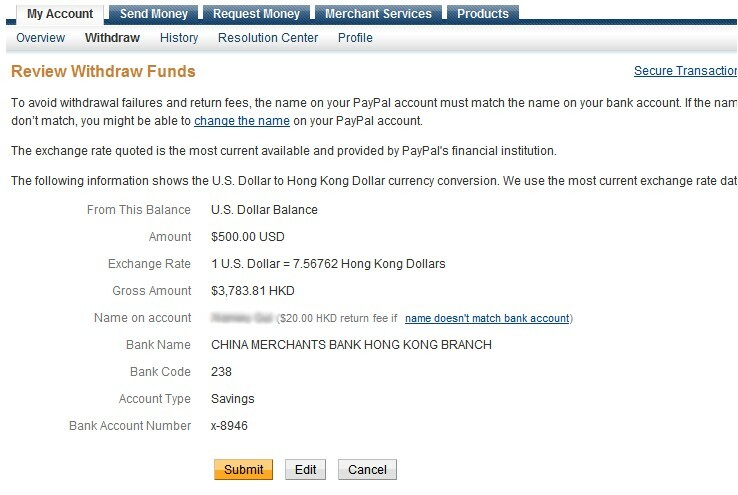 Here I withdraw money to HK Bank, then USD will be auto-changed to HKD and you can see the exchange ratio. Paypal will charge about 1.5% fee. After checking everyting is okay, then “Submit” your request. Money will arrive at your bank account around 3~5 or 5~7 days, depending upon country you are. We can accept the money send via Paypal, if you buy our metal dome (snap dome) or metal dome array (snap dome array) with our company (Best Technology), small amount (less than $500), you can send via Paypal. Very easily and it’s free for you to use it! Waaa. Wonderful? Yeah, we are always doing our best to provide best service, convenience, quality to our customers. Let me know if you have any questoin for that. 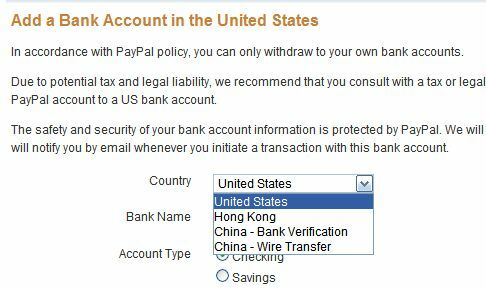 Why do I need to Pay Paypal Fee? This entry was posted in Beside Work, Business, Others and tagged payment, Paypal; transfering. Bookmark the permalink.